This describes the computer driven tracking system being developed to track artificial satellites, either visually or by using low light level video surveillance cameras. The system is currently under development by Greg Roberts (mechanical aspect) and Willie Koorts (software aspect) and has been under continuous development for four months. It has now reached the stage where sufficient details can be placed in the public domain so that others may duplicate the system or even improve further on it. The system is intended for amateur use and should easily be within the capabilities of most tinkerers. I have been involved in the optical and radio tracking of artificial earth satellites since the dawn of the space age in October 1957. Until about the late 1970's I was very active but gradually did less and less. When retirement started looming on the horizon people would ask me what I planned to do and my reply was that I planned to set up a CCD camera in my backyard and pursue my interests by operating the equipment remotely from inside a warm room sitting in front of a computer monitor. I retired at the end of October 1999 and for the first two months enjoyed myself by doing nothing. Then in December Willie told me about a local source of CCD cameras and I went and purchased one. After battling with trying to line up a telescope on a celestial object by sighting along the tube on my hands and knees (and battling to get back onto my feet subsequently) I thought of building a computer controlled system. I knew nothing about stepper motors other than that they could possibly do the job. I remembered Willie showing me a simple electronics circuit to control such so I paid him a visit and he gave me a copy of his circuit diagram and the source code for his elementary control program. Originally I planned to write all my own software but Willie tackled the task with such enthusiasm and efficiency that I soon lost track of keeping up and have now left the task entirely up to him since he is a far superior programmer than I am. After that there was no looking back and I have now achieved what I said I was going to do - operate my telescope remotely and in comfort! My automated satellite tracking setup consits of a motorised mount carrying a low-light surveillance camera (small white box) fixed behind an old TV camera telephoto lens. With the advent of relatively cheap low light level surveillance CCD cameras it has become possible to develop a relatively simple video tracking system. By video is meant the ability to sit in front of a computer terminal and remotely control a telescope equipped with an appropriate CCD camera and view the resulting image of the satellite being tracked on a video monitor. Such an image can be captured, either as a still frame, or as an AVI file or recorded on video tape for later analysis etc. The video unit currently in use is a KSC-16SC CCTV camera. This is a black and white low light level (0.05 lux) surveillance camera, approximately 57 x 52 x 55 millimetres in size and containing a 1/3 inch Sony CCD chip. It is fitted with a C/CS lens mount but since I wanted to use it on a telescope and the lenses available were not really suitable for my purpose (or pocket) I did not purchase any lenses. The unit gives out composite video and is powered by 12v DC at about 1.5W. From details of other CCD video cameras available on the Internet it appears very similar to the PC23C but is not identical so modifications to the PC23C cannot be applied to the KSC-16SC. It has no controls/adjustments and uses an automatic electronic shutter ranging from 1/50th second to 1/100000 second and is apparently controlled by the light intensity. The limited literature that comes with the unit (a small piece of paper) describes it as a 1/3 inch interline transfer CCD (it is not possible to identify the chip without unsoldering several components) complying with CCIR (PAL) or EIA (NTSC) standards. For CCIR the pictures elements are 537(H) x 597(V) and for EIA the values are 537 (H) x 505 (V). The scanning system is CCIR with 625 lines and EIA with 525 lines using a 2:1 interlace. The sync system is internal and the horizontal resolution is 420 TV lines. Sensitivity is given as 0.05 lux at F1.2. Gain is AGC with a S/N ratio better than 48 dB. The video output signal is 1v p-p at 75 ohm load and operating temperature range is -10° C to 50° C. No manufacturer identification is given other than made in Taiwan. A 0.02 lux unit is also available locally and will be purchased once funds permit it. Hopefully this will provide an extra magnitude gain. This depends on what the user has available. I had an old TV camera telephoto lens in my junk box with a focal length ranging from 25 to 150 millimetres and f/2.8. Since I use the unit only at 150mm the effective aperture is just over 2 inches. The focal length determines the size of the picture one can receive and in my case the field of view is about 1.9 x 1.4 degrees. I also have a 5 inch refractor, working at f/5 that the mount was actually constructed for and this gives a field of view of about 26.5 x 20.0 arc minutes. For tracking satellites I prefer the telephoto lens as it gives a useful field of view and since satellite predicted positions can vary somewhat from what is predicted the bigger the field of view the better ones chance of seeing the satellite. Other smaller camera lenses are available but have not yet been tested. Living as I do near the heart of Cape Town I have to suffer the disadvantages of a bright sky. On a good night I might be able to see down to magnitude +4.5 and perhaps visually track satellites down to about magnitude +3.5 with the unaided eye. However using the CCD camera with the TV camera telephoto lens I am able to track satellites down to about magnitude +7 and see stars to about magnitude +8, so the performance is very close to what one might get with standard 7 x 50mm binoculars. With the 5 inch refractor a satellite as faint as magnitude 9 should be visible. 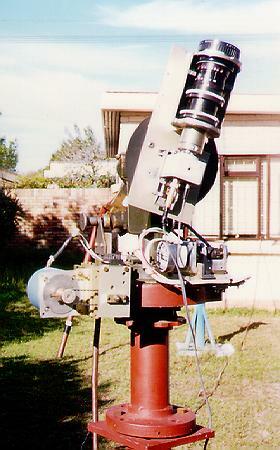 An old picture of my mount showing what it looked like about 30 years ago, here carrying the original 5" Apogee refractor, an alternative still to be tried. Any form of alt/azimuth mounting can be used and there is no standard. Basically stepper motors are attached to the azimuth and elevation controls and operate under computer control. Whilst the system employed can be used for astronomical purposes, without any modifications, a satellite tracking oriented system requires somewhat more stringent requirements as artificial satellites move considerably faster than stars. The mounting used was originally supplied by the Smithsonian Astrophysical Observatory as part of their MOONWATCH program. It was designed for gun laying in the US military and was manufactured by Bausch and Lomb. These are very scarce and unlikely to be generally available but may be found in the hands of retired MOONWATCH'ers. This should not be a handicap as any type of alt-azimuth mounting can be easily motorized - it will just take a little head scratching as to how best to mount the stepper motors. The unit is well constructed and rather heavy. The azimuth component consists of a large brass gear of 320 teeth against which meshes a spring loaded worm. This is mounted horizontally on a length of piping embedded vertically in concrete into the ground. Attached to the worm is a handle which was originally turned by the operator but now by a stepper motor. The azimuth gear is graduated in milli-radians (6400 divisions = 360° so 1° = 17.777777 mils). 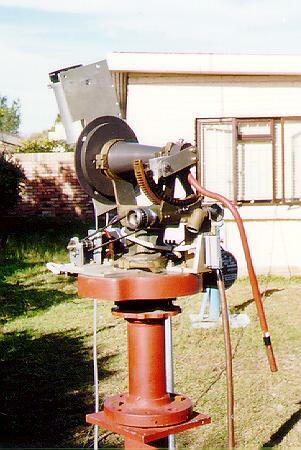 The elevation shaft is a cone fitted between two uprights mounted on a base plate which rides on a vertical cone in the centre of the azimuth gear. One side of the upright has a mounting plate for equipment and the other side has a bar fitted with a movable counterweight so that the equipment fitted can be balanced. On the same end of the elevation cone is a gear driven by a worm turned by a handle originally operated by the observer but now moved by a stepper motor. This is spring loaded and the quadrant gear has 32 teeth and is also graduated in milliradians. The two spring loaded gears caused problems with the stepper motors since they did not provide a constant friction load which caused the motors to stall too easily. Both worms were then modified slightly by providing an extra bearing point so that they could no longer "rock" against the gear and this provided a much smoother drive. By means of suitable gearing (ie what's available in the junkbox) the elevation and azimuth drives worms were attached to the stepper motors which had to be mounted on the azimuth base plate so that they are carried around on the head when the mounting is moved. This is not an ideal situation as the stepper motors vibrate and this is transferred to the image. After several attempts at various ways of mounting the motors this problem has been overcome and vibration is no longer a problem for most satellites. In order to get a smooth stepping motion (half stepping is currently used on both motors) it was eventually found that toothed belt drives gave the best results. The belts are not tightly stretched as this can cause stalling so the looseness in the belts helps with gears being off-centre, non squared on etc. There is also some "play" which has not yet proved a problem due to the size of the field of view - this could probably be corrected by the software if necessary. From this angle the azimuth drive motor (lower, left) is clearly visible. The cable run can also be seen dissapearing into my observing room. Ideally the azimuth speed should be somewhat higher, (by a factor of 3 or 4 times) especially when one needs to move through (say) 180° in a few seconds. However a faster speed may mean a bigger stepper size which could add a rather jerky azimuth track. The present system is nice and smooth with no jerking or obvious stepping. The elevation speed requirements are less than that for azimuth and the above speed is more than adequate. The azimuth and elevation drives were changed several times over the course of four months until the system has now reached a level where I am reasonably satisfied with the performance. The original elevation stepper motor had a basic step angle of 7.5° and this proved too course as stepping was very obvious at high elevations so was replaced by a motor with 1.8° step angle. My present mounting made the tracking requirements more severe than usual due to the fact that the gearing system built into the mounting slowed things down a lot. Consequently one has to gear up the speed of the stepper motors and run the motors as close to stalling speed as possible to get maximum speed. 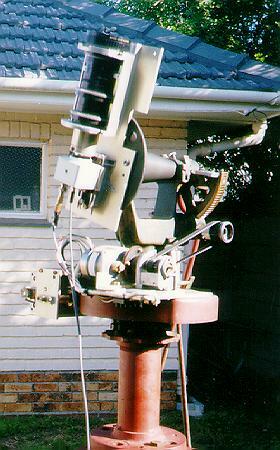 When I construct the mount for my 12 inch telescope I will probably use a mechanical system similar to that used by Mel Bartels and friends in driving their telescopes. My electronics interface box includes the stepper motor power supplies and electronics for driving the two motors with meters reading their drive currents. 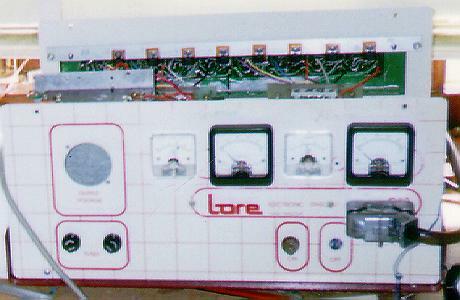 A re-used heatsink with its power transistors from an old printer can be seen fitted to the back. The connector and cable (below, right) connects to the telescope drive outside. Willie Koorts designed a simple stepper motor control system several years ago and forgot about it until I asked him for details. It is very similar to that developed by Mel Bartels - in fact Mels software has been tried on the system and can drive the system for astronomical purposes but cannot, at this stage, do satellite tracking. I must admit that I have not played too much with Mels software as I find the software developed by Willie adequate for all my requirements. In my case I originally used the electronics out of a wide carriage printer - stripping out the unnecessary components after tracing out the critical bits needed to drive the stepper motors and also using the power supply - in fact early versions of the satellite tracking system used the stepper motors out of the printer, but the elevation stepper was eventually changed as outlined earlier. Before rushing out to buy components etc see what you have in any old printer you can lay your hands on - most of the electronics is already present and can be easily modified for your specific needs. A replacement for the azimuth motor is now being considered and for this an entire new electronics system is being constructed as the new motor needs 2.5 volts at 4.8 amps. Hopefully this will provide plenty of torque so the azimuth speed can be increased. Much of the success of this project has been the result of the outstanding software produced by Willie Koorts. From an initial simple control program the software has now developed into a piece of art able to do just about anything - in fact whenever I think of a possible new application or need Willie has a new version with the requested changes a day or two later. The software developed by Willie is called CoSaTrak and is written in Pascal. Besides being able to calibrate the mounting, the program can locate and track astronomical objects and of course track artificial satellites in several modes. Fuller details on the program are given in Willie's contribution - who better able to describe it than the artist himself? CoSaTrak does not do its own satellite predictions, it instead uses text files with predictions of where the satellite should be at specific times. For this I wrote a program called SeeCoSat which generates SAT-files for use by CoSaTrak. After obtaining fresh satellite elemets and running SeeCoSat, the SAT-files are copied to the CoSaTrak directory (after deleting all old SAT-files first) for each observing session. This is still under investigation. The satellite video image is viewed on a composite video monitor or fed into a video graphics capture card. Both forms generate enormous files - and the easiest way has been to record the data on video tape. When trying to capture the data to hard drive it was found that frames were being dropped as the data rate was too high for the computer system used. A new and much faster PC is on the cards and hopefully will improve the situation and hopefully a better video capture card can be acquired - currently a TV video card is being used and there is a fair loss of quality. Audio commentary is given during a tracking session with time signals in the background and this is recorded on the video tape which makes things easier for later analysis etc. A fair bit of testing etc remains in this area. Ideally I would like to capture a field showing the satellite against a background of stars at a known time. Using second party software such an image could be overlaid on a star chart - such as provided by the excellant program GUIDE and several others - and the coordinates of the satellite read off to provide a time and position that can be used in orbit determination. Rotated by 180° in azimuth reveals a better view of the altitude drive showing the belt drive to the worm and gear. 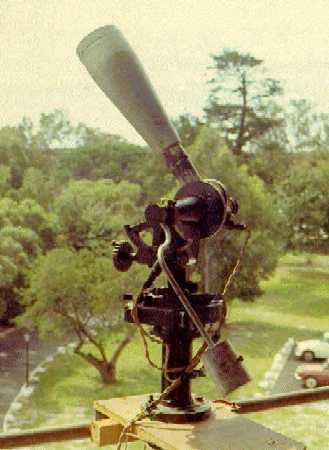 The weight from the counterweight stork has been removed since it is not needed when the lens is mounted. At the time of writing we are on CoSaTrak Version 1.33 and are obtaining excellant results. Over 200 satellite passes have been tracked and except for certain types of pass - eg a zenith pass where azimuth swings through as much as 180° in next to no time (an impossible situation for the present setup and most any other system! ), it has been possible to track most if not all of a pass with the satellite image appearing virually stationary on the screen as the stars pass by. It is fascinating to see how satellite brightness changes with phase angle - in some cases we start tracking blind (ie "auto mode") and let the mounting follow the predicted computed path until the satellite either brightens or does a flash which then shows where the satellite is on the screen. Iridium flares are spectacular! - its also fun to follow slowly tumbling satellites and get a flash (say) every 20-30 seconds or more. It is easy to time such flashes and determine the period if the flashes follow any kind of pattern. A fair percentage of satellites produce flares or specular reflections and these can be studied in greater detail if required. Positional work has not yet been tried - due to lack of time - but is is sometimes obvious that the orbital data is not that accurate - its very easy to determine the culmination elevation and thus compare it against that predicted. Willie is constantly looking for new ways to improve his program so I have to help him by dreaming up new applications. One that will be implemented soon is the ability to automatically record the date, time , azimuth and elevation of what is shown on the screen. Since one is able to position the satellite in the centre of the screen it will be possible to get as many times and positions as one wishes during a transit. This will help in orbit determination and satellite identification where necessary. Another option we wish to pursue is the imaging of satellites such as Mir, ISS or the shuttle etc. This has been done quite succesfully by others and we see no reason why our system cannot do the same. It does of course mean using higher powered telescopes etc so this will be one use for the 12 inch telescope. I have always been fascinated by satellites in very elliptical orbits with high apogees, geostationary and near-geostationary satellites etc so this will be another use for the larger telescope. Again its a case of the telescope and not the software being the delay in implementing this application. Having developed a useful tracking system one might ask what is the use of such? For those interested in optical characteristics, tumble periods etc it is obvious that the system has much to offer. Originally the idea was to do positional work - the idea has not yet been dropped but there are several problems - with a star background limit of about magnitude 8 there are not that many stars in a field of view of about 2°. Secondly one has to find a way to add precision time to the data record so that one can determine the time of an event - ideally a time, reading down to say 0.01s that is recorded on the video frame would be nice - probably can be done but still has to be thought about. It is also possible to record time signals on the video tape. It is possible to grab a frame and overlay this on a star chart such as GUIDE and read off a position but time still remains a problem so this needs some attention still, but since its still early days in the development of this project I am sure we will eventually solve it. Its great to sit in a comfortable armchair in a warm room and watch a satellite being remotely tracked on a monitor whilst a cold wind blows outside - its FUN and that's what a hobby should be. Finally I would like to express my thanks to Willie for his help and encouragement. By nature I am very lazy but with Willie's enthusiasm and drive he has kept me busy and I have thoroughly enjoyed my first six months of retirement and look forward to doing more exciting things with his program. 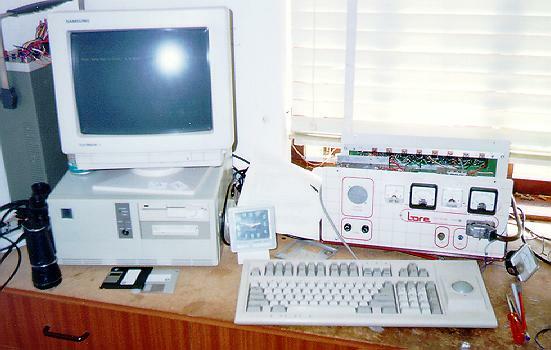 My "satellite tracking control centre" (not showing the monitor and VCR) seen here during its development stages.